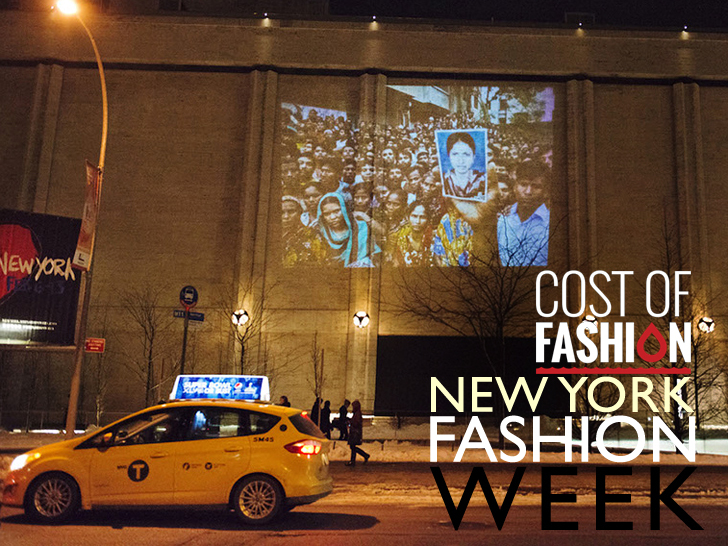 Labor activists threw a spotlight on the plight of Bangladesh's garment workers on Thursday in the most literal way possible: by beaming the faces of Rana Plaza's victims onto the exterior of Lincoln Center during New York Fashion Week. The installation, conceived by Bangladeshi photojournalist Ismail Ferdous and filmmaker Nathan Fitch, in collaboration with 99 Pickets and The Illuminator, laid plain the fashion industry's seedy underbelly ahead of the one-year anniversary of the disaster, which killed more than 1,133 people and injured thousands more on April 24. Despite the ensuing interval, only a third of the companies that used factories in the facility have offered to compensate the survivors and the families of the deceased. Protestors also marched upon The Children’s Place, one of several retailers, along with Walmart, JCPenney, and Mango, that have failed to compensate victims of the disaster. Protestors also marched upon The Children’s Place, one of several retailers that have failed to compensate victims of the disaster. Flores calls specifically for Gap, which spearheaded a dueling safety pact that labor groups have labeled a “sham,” as well as VF Corp., which owns The North Face, Timberland, and Wrangler brands, to sign immediately. Protestors also marched upon The Children's Place. The apparel chain is one of retailers that have failed to compensate victims of the disaster. Others include Walmart, JCPenney, and Mango. Activists recovered documents and labels for The Children's Place among the debris shortly after Rana Plaza's collapse. The company has yet to trade its platitudes for meaningful action, however. "We are...working with our fellow retailers and other organizations to ensure appropriate measures are put in place to avoid future safety issues," it said in a statement following the disaster. "We will be evaluating a number of alternatives to support that goal—including participating in discussions with various industry and [non-governmental organization] groups—and will be active in supporting important, systemic reform." "New York Fashion Week was an ideal venue for this protest since one of the Walmart board members, Christopher Williams, is also on the board of the Lincoln Center where the event was held," Michelle Flores of 99 Pickets, tells Ecouterre. "We are also demanding that those U.S. brands who have not signed on to the Bangladesh Accord on Fire and Building Safety to do so now," she adds. Flores calls specifically for Gap, which spearheaded a dueling safety pact that labor groups have labeled a "sham," as well as VF Corp., which owns The North Face, Timberland, and Wrangler brands, to sign immediately. 99 Pickets, a group born from Occupy Wall Street, seeks to help build a mass workers’ movement in New York City and beyond. The Illuminator assisted with the protest by using a cargo van equipped with video and audio projection.